The seal of God in the foreheads is in reference to the Sabbath keepers of that time. After Mohammed passed away, the next man to be the religious leader of the Saracens was Abu Bakr AD 632. Notice what he said as he gave order for his Saracen bands. Jesus would destroy those who are destroyers and desolaters. The pagan Roman empire was desolated by the Barbarian tribes of the west. The Catholic church with its monasteries and monks were being destroyed by the Saracens. Destroy them yet there are some who are not monks who devote themselves to the worship of God, don’t touch them. These people who were Sabbath keepers, they were not to be touched. Whereas the monks weren’t and were destroyed. A direction of hurting neither trees nor the grass and only destroying those who did not have the seal of God. That is precisely what happened. As these Saracen bands came into the Roman empire and were attacking and destroying only those of Catholicism, but they were not killing them but giving them a really hard time. They wanted to die but they couldn’t. They were attacking the eastern Roman empire but they never really thoroughly conquered it. The eastern Roman empire would not be totally decimated until five months would be complete. Revelation 9:7 And the shapes of the locusts [were] like unto horses prepared unto battle; and on their heads [were] as it were crowns like gold, and their faces [were] as the faces of men. “When Mahomet fled to Medina and was first received as its prince, a turban was unfurled before him to supply the deficiency of standard. The turbans of the Saracens, like unto a coronet, were their ornament and their boast. The rich booty abundantly supplied and frequently renewed them. To assume the turban is proverbially to turn Mussulman. And the Arabs were anciently distinguished by the miters which they wore.” Daniel and the Revelation page 501 The Moslem World. “And their faces were as the faces of men.” “The gravity and firmness of the mind (of the Arab) is conspicuous in his outward demeanour;… his only gesture is that of stroking his beard, the venerable symbol of manhood… The honor… of their beards is most easily wounded.” Daniel and the Revelation page 501 The Moslem World. Why does it say faces of men? How were men identified in the Old Testament. Long hair is esteemed an ornament by women. The Arabs, unlike to other men, had their hair as the hair of women, or uncut, as their practice is recorded by Pliny and others. But there was nothing effeminate in their character; for, as denoting their ferocity and strength to devour, their teeth were as the teeth of lions.” Daniel and the Revelation page 501 The Moslem World. This is the strange impact of these Arab Saracens as they came and swooped in and did their hurting suffering works that people didn’t want to live anymore. 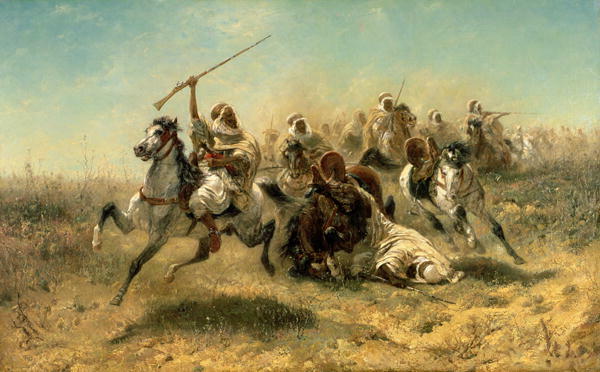 The standard of the Arab was the horse’s tail. The Arab horses have a particular attractive tale. That was their identification mark of their sting. It was in the year 1449 that Constantinople was finally conquered. Not until then. In those 150 years the Saracens were giving the eastern Roman empire a hard time but they didn’t conquer it. Just imagine it. No wonder it says they didn’t want to live anymore. You can see how the orchestration of the wicked was such that those who were persecuting Gods people were being hurt and desolated by the other opposing forces. God pays back. “Thus far Keith has furnished us with illustrations of the sounding of the first five trumpets. But here we must take leave of him, and, in applying the prophetic periods, pursue another course. 14. What change was made in their mode of conquest in the South and West? Was this true of the East? State what is said of their warfare in the East. 35. To what should these things lead us? Posted on August 14, 2012, in Revelation, Short Studies. Bookmark the permalink. 1 Comment. Sabbath is the seal of the Most High God .